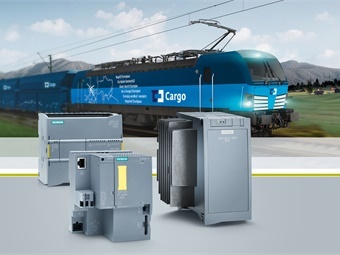 New Siemens automation controllers for rail applications are being launched on the market. The new rail-tested and approved Siplus extreme rail devices are based on the latest generation of Simatic S7 controllers and are specially designed for the extreme conditions encountered in rail applications. The new range includes the Siplus extreme Rail S7-1500 and S7-1200 Advanced, Basic and Distributed controllers with ET 200SP, as well as the Siplus HMI KP300 Basic rail panel for operator control and monitoring. The devices have comprehensive certifications and all the necessary rail approvals (EN 15121, 45545, 50124, 50125 and 50155) and can be used on board the train or on the track for a wide range of automation tasks covering all rail applications. Typical applications are heating, ventilation and climate control (HVC) systems in the train and signal systems, door drive systems on platform screen doors, or sanding and lighting systems in the depot. The network Siplus extreme rail devices supersede the existing Siplus S7-200 and -300 technology. For configuration and commissioning of the new Siplus extreme rail devices, the user can use the TIA Portal (Totally Integrated Automation) engineering framework, as in the case of the standard Simatic controllers. The data storage facilities of the portal, the practical library concepts and standardized operating philosophy support the user with global functions. Using this coordinated system, comprising new Siplus extreme rail equipment, Profinet-based communication and engineering in the TIA Portal, the user can create efficient automation solutions for rail applications quickly and easily. The new Siplus extreme rail devices are designed and tested from the outset for extreme environmental conditions such as humidity, corrosive gases, salt spray, dust and electromagnetic interference. In addition, they are designed to meet the more exacting demands of rail applications, such as "mobile" use in trains. Measures include testing of the behavior and side effects of fire with regard to the materials used and the special conformance coating of the electronics in accordance with EN 50155. The temperature classes specified in the standard differ according to the product: for TX, minus 40 to plus 85; and for T1, minus 25 to plus 70 degrees Celsius. Prior to shipment, each Siplus extreme rail product is subjected to an insulation test required by the standard to ensure dielectric strength.